Various platforms have demonstrated the value of hands-on activities – such as community gardening and crafting – in making meaningful connections and collective identities for a sustainable and resilient future. In his seminal book, Flow: The Psychology of Optimal Experience (1990), psychologist Mihaly Csikszentmihalyi describes how these activities can be an opportunity to engage with ‘flow’ – a highly focused mental state that increases awareness, connectivity and well-being. In Through Vegetal Being (2016), philosophers Luce Irigaray and Michael Marder also argue that it is through ‘vegetal’ (or plant relating) activities in particular (e.g. touching and smelling plants), that our relations with the more-than-human world can be reignited. Drawing upon these publications and others, this paper explores how combining these two modes of thought – to enable ‘flow’ through shared ‘vegetal’ or plant-based activities – may assist communities in gaining a greater awareness of and connection to sustainability. The potential of plant-based creative activities are examined through a recent, practice-led, arts-science research project (Refugium WA, Australia 2017), which used scientific knowledge and ‘vegetal’ or ‘botanical’ crafting as a way of engaging people in biodiversity issues. The project employed the community in creating mini native plant- sculptures which were temporally installed at the State Library of Western Australia. Indication of flow, increased nature-connection and biodiversity understanding were explored through gathering observations of the participants, pre- and post-activity surveys and discussions. 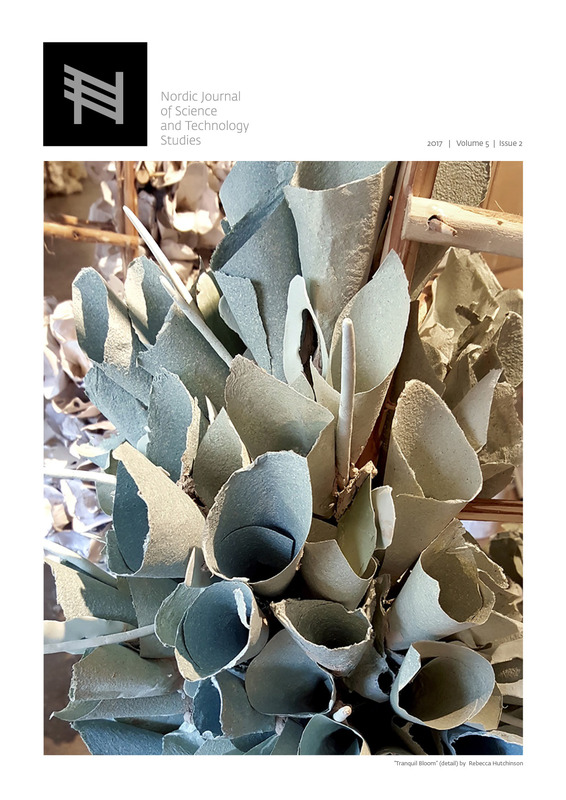 The research sought to examine the capacity for vegetal- crafting activities to lead to new modes of arts-science communication that connect people to the importance of biodiversity in urban spaces. Dr Tanja Beer is an award winning ecological designer, community artist and Academic Fellow in Performance Design and Sustainability (Ecoscenography) at the Melbourne School of Design (University of Melbourne, Australia). She has more than 15 years professional experience, including creating designs for a variety of theatre companies, venues and festivals across the globe. Since 2011, Tanja has been focused on the development of transdisciplinary ecological arts practices. Her most significant work is The Living Stage, a global initiative that combines stage design, permaculture and community engagement to create recyclable, biodegradable and edible performance spaces. Also see: www.tanjabeer.com. Cris Hernandez Santin obtained her Master of Environment at the University of Melbourne, Australia and is a trained ecologist with a Bachelor of Biology, Universidad de las Americas (Mexico). She has extensive experience within Landscape and Participatory Design and has recently specialised in sustainable cities. She is currently researching the complexity of integrating design disciplines with ecological science through Biodiversity Sensitive Urban Design – a project supported by design experts at The University of Melbourne, ecology experts of RMIT and the United Nations Global Compact–Cities Programme. She continues her journey in practice and research and continues to seek out strategies to integrate nature within cities. Volume 1, edited by David Rapport and Linxiu Zhang, 123–164. Washington: Millenium Assessment Report series. the City’s Future. Sydney: UNSW Press. Bragg, Rachel, Carly Wood, Jo Barton and Jules Pretty. 2013.
and Essex Sustainability Institute. [cited 14 August 2017]. Journal of Wellbeing 6(3), 1–48. Chen-Hsuan Cheng, Judith and Martha C. Monroe. 2010.
nature.” Environment and Behavior 44(1), 31–49. ture and applications.” Art Therapy: Journal of the American Art Therapy Association 30(2), 64–70. Condliffe, Zoë, Tanja Beer and Marnie Badham. Forthcoming. ecological artwork in public-private space.” GPS Journal 2. Management and Restoration 10(3), 174–184. Environmental Education 29 (2): 182–201. periencing flow in work and play. San Francisco: Jossey-Bass. experience. New York: Harper and Row. view as Basis for a Regenerative Sustainability Paradigm for the Built Environment.” Journal of Cleaner Production: 53-61. Critical Realism 13 (3): 304–325. ment of natural resources.” Society & Natural Resources 29 (8):948–964. Philosophical Perspectives. New York: Columbia University Press. ceedings of the National Academy of Sciences 105: 2757-2758.
well-being.” Psychological Assessment 28 (5): 586–597. craft thinking and authenticity.” Craft Research 7 (2): 165–185. Outcomes.” Trends in Ecology & Evolution 31 (9): 657–660. Mustapa, Nor Diyana, Nor Zarifah Maliki, and Aswati Hamzah. and Behavioral Sciences 170 (2015): 330-39.
hotspots for conservation priorities.” Nature 403: 853–858. Michael J. Furlong, Richard Gilman, and Scott Huebner, 89-105. Nisbet Elizabeth K., John M. Zelenski, and Steven A. Murphy. 2009.
vironment & Behavior 41 (5): 715–740. Parks and Wildlife. 2014. Wetland mapping: Swan Coastal Plain. [cited 14 August 2017]. Available from https://www.dpaw. Ramalho, Cristina E., Etienne Laliberte, Pieter Poot, and Richard J.
sity hotspot.” Ecology 95(9): 2466–2478. Robertson, Margaret. 2014. Sustainability Principles and Practice. Sandifer, Paul A., Ariana E. Sutton-grier and Bethney P. 2015.
ment. New York: Simon & Schuster. ability discourses through an evocative visual agenda.” Ecology & Society 20 (4): 242–250. environmentalism”. Children Youth and Environments 16:1-24. Wilson, Edward. O. 1984. Biophilia. Harvard university press.